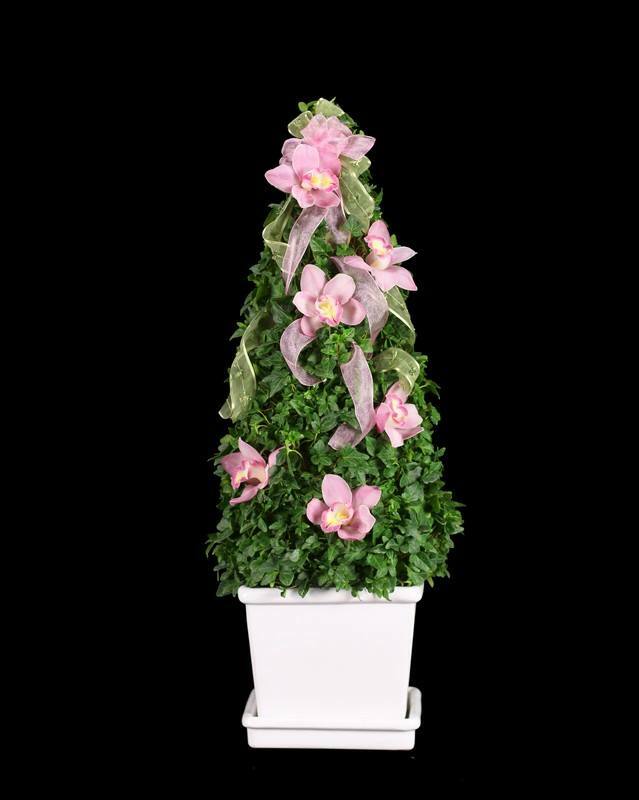 This ivy live topiary plant is a beautiful addition to any home. With verdant leaves and a beautiful form, it is ready to take on any shape that the owner wants. It can be trained to grow into a new shape, or it can be kept the way that it currently is. For the best results, it should be kept at an indoor temperature range of 40° to 80° F. It comes in a pot size of eight inches and a weight of 6.5 pounds. Designed to work well in bright, indirect light, it should be allowed to dry out between watering times. With live topiary plants, homes get a whimsical look for any patio, home or deck. Fresh topiary plants have been popular home decorations for centuries. This living sculpture boasts of green foliage and a uniquely beautiful shape. With care and attention, it can be trained to grow in other shapes like spirals, hearts and animals. For this fresh topiary plant to thrive, it must be placed in a site that receives partial shade. Direct summer sun will dry out the plant, so it should get a partially shaded spot that reaches about 60° to 75° F during the day. At night, the temperature should not fall below 32° F.
To water the plant, owners should wait until the top inch of the soil has dried out. If it is watered too frequently, the ivy topiary's roots will start to root. The plant should be watered near the base until the soil is evenly moist. Since live topiary plants love humidity, they should be misted once or twice a week with lukewarm water. This should be done until the leaves start to drip water. For the best results, the plant should be misted during the morning so that the water has evaporated by nighttime. Fertilization should be done with a regular 10-10-10 fertilizer. In general, this should be done every four weeks or according to the directions on the fertilizer. As the plant grows, the owner should wind any loose vines around the topiary so that it continues to grow into the same shape.